A team of astrobiologists has redefined conventional notions of where life can exist within a solar system. They've suggested that life could exist inside planets with inhospitable surfaces. Dubbed "subsurface habitable zones," this new definition of habitable zones means that alien life may be far more prevalent than we ever imagined. Typically, a solar system's habitable zone, or so-called "Goldilocks zone," is a fairly narrow band within which planets can foster liquid water at the surface and cling to a stable atmosphere. For our solar system, this life-imbuing region of space extends from Venus to Mars. But as a team of researchers from Aberdeen and St. Andrews universities are now arguing, this traditional definition fails to take into account life that can exist beneath a planet's surface. Indeed, as extremophiles on Earth have shown, life can be incredibly resilient. What's more, temperatures increase as depth increases; once temperatures can foster liquid water, it's conceivable that life can exist there, too. To show that this is the case, the researchers used a computer model to approximate temperatures below the surfaces of planets by entering the distance to their respective stars while referencing it to the size of the planet. This allowed them to come up with a subsurface habitable zone (SSHZ) map. Results showed that the habitable radius around a star increases three-fold if life can exist 3.3 miles (5.3 km) below the surface (which is the case on Earth). If it can exist as far as 6 miles (10 km) down (not impossible), that would extend our solar system's SSHZ by a factor of 14. That's beyond Saturn — a range that would have to include moons like Europa and Ganymede, both of which are thought to host subsurface oceans. This means that Venus could also be deemed potentially habitable despite its boiling hot surface. Incredibly, lead researcher Sean McMahon says this opens up the possibility that even rogue planets adrift in interstellar space could even harbor life. 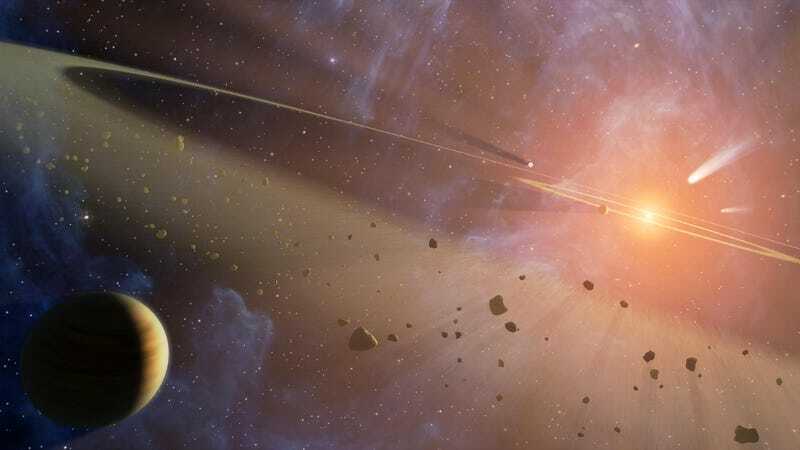 "Rocky planets a few times larger than the Earth could support liquid water at about 5 km below the surface even in interstellar space...even if they have no atmosphere because the larger the planet, the more heat they generate internally," he told IBT. At the same time, the idea of SSHZs will dramatically increase the number of exoplanets and exomoons considered suitable for extraterrestrial life. In fact, more life may exist inside planets than on the surface; the Earth might actually be somewhat of an anomaly. Of course, what we're talking about here is primarily microbial life (though probably not exclusively). What would be really fascinating to know is the habitable zone specific to radio-capable intelligent life (to borrow from Frank Drake). Call it the rcIHZ. Read the entire study at Planetary and Space Science: "Circumstellar habitable zones for deep terrestrial biospheres." Top image: NASA/JPL-Caltech; inset image via McMahon et al.